Author, outdoorsman, and environmental philosopher John Muir is one of my heroes. In particular, this quote of his embodies how I seek to live my life. My whole life, I have always found comfort in nature. I travel to rural environments every chance I get. Many people who know me know that I climb trees for fun! Ultimately, I don’t know where I would be without the comfort of the natural world. I was diagnosed with NVLD when I was 14 and in the ninth grade after failing physics and geometry and struggling with many of my other classes. My personal struggles with NVLD include issues with visual recall, depth perception, visual-spatial relations, understanding of some abstract concepts, and processing speed. I also struggled socially, which I believe was due to a combination of my NVLD, high school hardships, and needing to find my own “circle” and a sense of self-worth. I went to high school on the Upper West Side of Manhattan, and the big city life made me frequently feel like something was missing. I missed vast fields of trees and green, the sounds of birds chirping in the morning and being able to see the stars at night. When it came time in the middle of eleventh grade to start the college search application process, I felt very discouraged because I didn’t think I was smart enough. Fortunately, though, my parents had heard of Landmark College, exclusively for students with learning disabilities located in rural Southern Vermont– a definite contrast to New York City. The following summer, I attended Landmark’s High School Summer Program and loved it. I learned valuable academic strategies and met some awesome people. And, for the first time in forever, I was in a place where I could see the stars at night. I didn’t want to come home. I also knew that three weeks were not enough to gain all I could from Landmark. I went to Landmark for two years and earned my Associate Degree in Liberal Studies. I absolutely fell in love with the Green Mountain state. It was partly because I was so happy academically and socially, and also partly because I was living in the countryside. Even though I am doing very well in school and in my internships in the New York City area, I look forward to every opportunity I can to go to places like Vermont, New Hampshire, or rural Massachusetts. Vermont holds a special place in my heart. 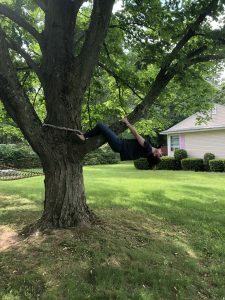 Many of my friends affectionately call me “the tree girl” or joke that I climb every tree I see (actually, doing so when I’m out in the country isn’t far off). The keyword there, too, is friends. I am so grateful to have friends who love and accept me for who I am. Having NVLD has provided me with a set of struggles and challenges. I think of hiking and climbing mountains and trees as a metaphor for strength and overcoming obstacles. My advice, especially as a future social worker to students with LD, is to find your comfort zone and happy place, wherever that may be.